BRIGHTON, Mich. - If you haven't checked out the 2013 Ford Edge yet, we have to say you're missing out. This vehicle stands apart from other crossover SUV's and is a vehicle worth checking out, if you haven't already. Since we are a little biased when it comes to the best crossover (we vote Ford, all the way), we've put together 3 reasons why the 2013 Ford Edge is a smart buy. 1. 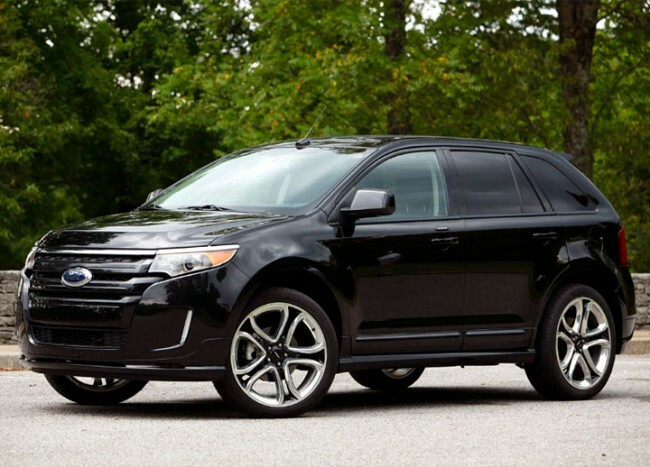 The Ford Edge has multiple engine options - three to be exact. The first is a 4-cylinder option with EcoBoost technology that produces 240 hp and gets up to 30 mpg on the highway. The second and third are V6 engine options (a 3.5-liter and a 3.7-liter) that have the ability to tow up to 3,500 lbs. So not only is the Edge fuel efficient, it's extremely capable too! 2. It's more stylish and spacious than most. The Ford Edge has beautiful interior details - everything from high quality wood grain accents and ambient lighting to duel information screens, and more. Plus, it offers up to 69 cubit feet of cargo room when the seats are folded down. That's quite a bit of space! If you don't need the space for cargo, the Edge has seating for up to five passengers. 3. It's comfortable and safe. When it comes to purchasing your vehicle, safety is always a huge priority. With the 2013 Ford Edge, you get antilock disc brakes, stability control, front-seat side airbags and full-length side curtain airbags. If you have a young driver, the Ford Edge also gives you the ability to limit speed and sound volume settings - something your teens won't be happy about, but will offer you peace of mind! As for comfort, the seats are supportive and comforting, while the drive is smooth and quiet. What more could you ask for? We've given you 3 reasons why the 2013 Ford Edge is a smart buy, but it eventually comes down to what works best for your lifestyle and needs. If you'd like to go over your options, or just discuss what features you're looking for in a vehicle, stop by and see us! We are more than happy to help you find a vehicle you'll love - no matter if it's a New Ford Car, New Ford Truck or a Certified Pre-Owned Car For Sale. We're here to help!